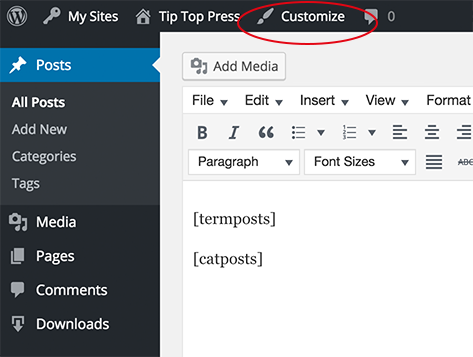 WordPress admin sides have some areas, configuration panels or widgets to configurate. So you can get all settings in only few clicks. And it wasn’t WordPress if you can configurate all. So we decided to expand this navigation buttons with a additional customizer link. If the user is in post or page edit mode and use our widgets: Term and Category based Posts Widget or Category Posts Widget. WordPress don’t supports this link because there is no need for this link without using our widgets. But our widgets give you the oportunity to add shortcode in the content area and configurate it in the customizer. Right, we propose the shortcode configuration only in the customizer. 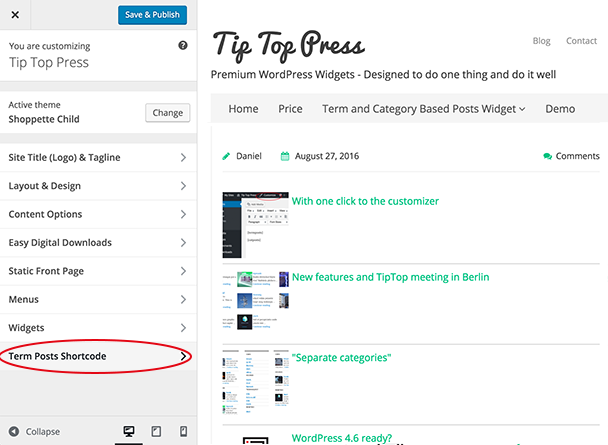 We know and use widgets which extends WordPress’s admin navigation buttons, menus, etc. For example for navigating between posts or pages with a forward and backward button with the Admin Post Navigation. Widgets like this can be very helpful to change many posts in a row and there is no need to go back to the post edit-site and admins save a lot of time. We decided to write not a own widget and we also decided to make this link not configurable to show or hide. The link we set is fix. Second reason is we had a lot of options to configure and we search a more computed way to do this configuration with shortcode. Help us us to improve this feature. Most of all we’re looking forward when you write as a comment or private message.